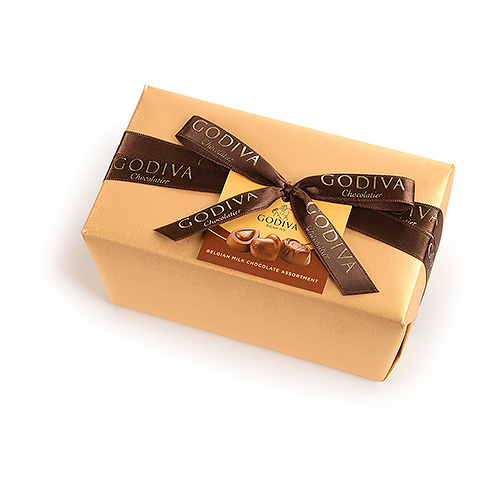 The ultimate gift from Godiva. The classic and elegant Belgian ballotin wrapped in luxurious gold paper with a hand-tied ribbon contains a rich assortment of Godiva premium milk chocolates, carefully selected to offer a wide range of the finest fillings to suit all tastes. Ingredients: Sugar, full cream powder, cocoa butter, cocoa mass, hazelnuts, almonds, cream, glucose syrup, vegetable oil (palm kernel, palm, rapeseed, sunflower), butter oil, pecan nuts, invert sugar syrup, sweetened condensed milk, humectant (sorbitol), milk, wheat flour, emulsifier (soy lecithin), hydrogenated vegetable oil (palm kernel), butter, flavourings, macadamia nuts, apple, rice flour, skimmed milk powder, salt,wheat starch, cinnamon, milk sugar, milk protein, wheat malt, honey, barley malt flour, natural vanilla, wheat gluten, whey powder, lemon peel, dextrose.